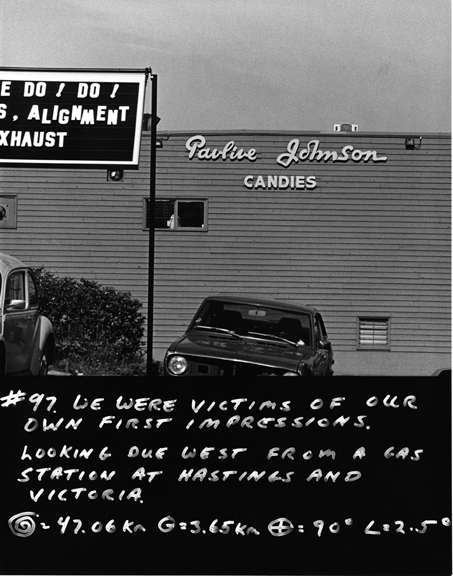 Beyond Vague Terrain is the multi-artist exhibition at the Surrey Art Gallery that tells the story of the Lower Mainland and its industrial terrains, pre- and post-Expo 86, through serial images and photography. The growth of suburbia and its vast supporting infrastructure was well underway in the late 20th century, motivating artists and urbanists alike to speak of “defeatured landscapes” or “non-places.” The interchangeable and transitional post-industrial locales punctuated by such familiar structures as multi-lane freeways, big box retail outlets and office parks. Similarly, the Surrey Art Gallery’s upcoming exhibition, Beyond Vague Terrain, named for architect and philosopher Ignasi de Solà-Morales’ notion of “terrain vague” in relation to non-places like freeways and low-density commercial zones, deals not only with the physical landscape of the city, but also with the figurative landscape of recent art history. The works presented in Beyond Vague Terrain are joined by their use of serial imagery, or multiple images within the same artwork, a departure from the singular images typically associated with artistic depictions of urban landscapes. Beyond Vague Terrain is situated in contemporary art history. Strom notes that the 1970s were a watershed for serial imagery in art, the developments in video art becoming an influence on photography and then to other forms of visual art. One of the featured works in Beyond Vague Terrain, Khan Lee’s 109-foot light box panorama Millennium Line (2011), is a good illustration of this point. Millennium Line’s use of a moving SkyTrain to compose a panoramic shot can be likened to the use of a dolly to construct panoramas in film. In the pre- and post-Expo years (from the late 1970s through to the 1990s), Vancouver became known for a loose movement of conceptual artists – especially photographers – who interrogated, among other things, its cityscape, a cityscape in transition. Collectively, they would be known as the Vancouver School; associated with the group were such artists as Jeff Wall and Ian Wallace. Incidentally, both artists are featured in the Vague Terrain exhibition, along with more contemporary artists like Lee. With these points in mind, we note that space and the perceptions thereof (and therein) are major themes in the works featured in Vague Terrain. For instance, Bill Jeffries’s Panopticon: 103 views of the Scotia Bank Tower (1978-79) traces a path over Vancouver around what was then the tallest building in the city, with 103 annotated photographs taken from a variety of locations. Similarly, Jeff Wall’s 1969 booklet Landscape Manual takes the form of ruminations set to a series of photographs taken by Wall from the window of a car. Helma Sawatzky’s work subverts the seamless compositing normally seen in digital photocollages. 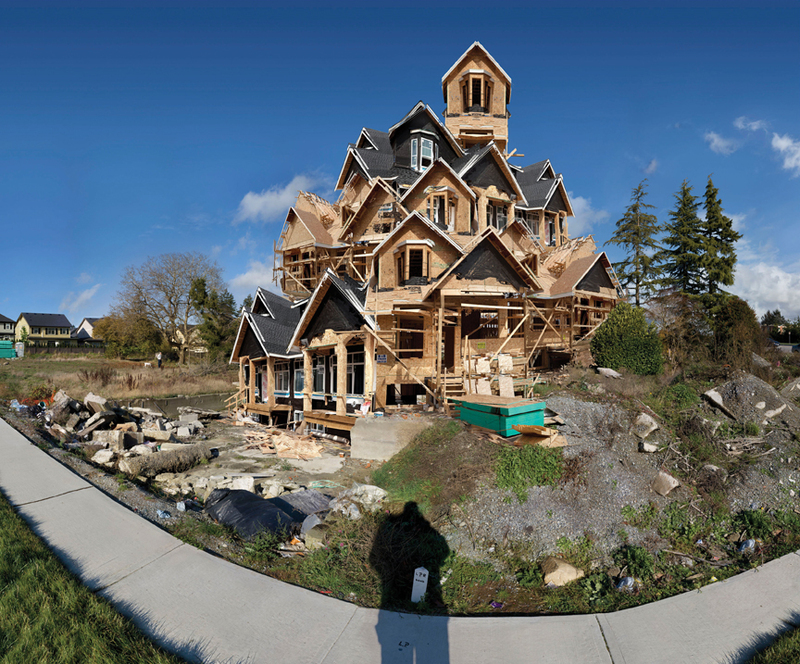 In Morgan Crossing, from Construction Sites Phase II (2009) or, more strikingly, The Phoenix Complex (2012), one can clearly see the disjunctions between the different angles of the works’ constituent photos, yielding an almost cubist effect to her composited panoramas of construction sites in South Surrey. Yet these disjunctions seem to flow seamlessly into the image, which looks subtly rickety as opposed to merely glitchy, at least at first glance. Sylvia Borda’s Every Bus Stop in Surrey, BC (2004) maps and “recontextualizes” (as Borda puts it) Surrey’s geography through a database of every bus stop in the city (as the work’s title makes explicit). In her statement for Every Bus Stop, Borda makes a particularly appropriate reference to the work of a French photographer named Eugene Atget, who documented Paris in the throes of its own redevelopment (the widening of its boulevards) – Surrey can be said to be in a similar transitional state. “The birth of any city is nothing new; however, its transition from an earlier state to another happens only once,” Borda writes. Jeremy Hurndl’s paintings of North Surrey neighbourhoods also deal with notions of transition and passage of time in the city. Made over a period of six months, Hurndl’s paintings inevitably incorporate a degree of flux: as the press release put it, they “depict an ever transforming view” of his subject. While many of the artists featured in Vague Terrain are associated with Vancouver area, Strom says the exhibition is not necessarily about one place or another – rather it is balanced between “the particular and the general,” he says. There are other commonalities between the works. Realism, a documentary impulse, approached in a non-straightforward way, like the askance angles of Sawatzky’s panoramas of construction sites – and, most of all, a concern with transition, whether geographical or (art) historical.